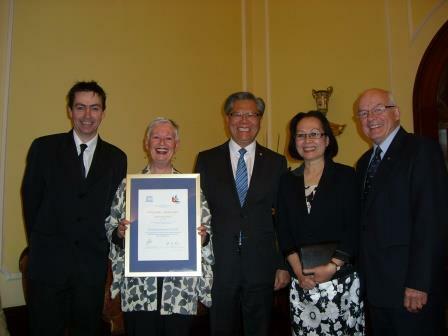 The Penola Coonawarra Arts Festival has been honoured by the United Nations at a special function hosted by the Governor of South Australia, His Excellency the Honourable Hieu Van Le AO, at Government House on 10 August 2015. Three Penola Coonawarra Arts Festival Committee members, President Rhett McDonald, Secretary Helen Edwards and Past President Peter Muller accepted the award on behalf of the Festival from UNESCO (United Nations Educational, Scientific & Cultural Organisation) for its work enhancing the cultural development of the region over the last 24 years. In addressing the 100 guests assembled at Government House, Chairperson of the UNESCO Adelaide Chapter, Mrs Helen Rice, commended the Festival to the Governor stating, “this is one of South Australia’s leading regional arts festivals,”. Dr Bernard & Mrs Leanne Doube for their scientific work with dung beetles. The award certificate is on display for the public alongside the Festival’s 2013 SA Regional Arts Award in the John Shaw Neilson Gallery of the Penola Visitor Information Centre.